Since our inception, we are engaged in manufacturing, supplying, and supplying a wide range of excellent quality Food Cart. The provided cart is manufactured using stainless steel, aluminum and fiberglass sheet. 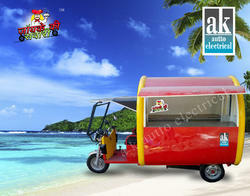 It is also made of using double axle with brake system and open lifting pulley. The maximum speed of the cart is 60kms per hour. This cart is used as for carrying dry storage, top side display area plus additional under counter dry storage. Additionally, this cart is also made available at reasonable prices at our outlet. With the assistance of our deft team of professionals, we are able to manufacture, supply, and export a broad array of Food Cart. This cart is manufactured using steel and iron metal frames. 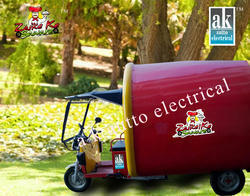 The maximum speed, which this cart can attain, is 60kms per hour. Also, the offered cart is manufactured using double axle with brake system and open lifting pulley. Steel, aluminum and fiber materials are used for developing the body and frame. This cart is used as food stall, food carriage and vegetable sales in the market. Looking for Food & Beverage Cart ?